The market can only ever do one of three things – go up, down or sideways. However, in comparing the ups and the downs, there is a particular difference between the two that is interesting to market participants. The difference is that most markets tend to move down quicker than they move up. In fact it is said that markets move down 3 times faster than they go up. This applies to all types of markets (stock indexes, futures, individual stocks, currencies, etc. ), and to all timeframes (fifteen minutes, hourly, daily, etc.). The reason for this tendency can be pinpointed to the human emotions that are associated with rising and falling markets. For example, when the markets are going up, the emotion of greed is in control, so the public buy stocks, which gives the markets short term momentum to the long side. When the markets are going down, the emotion of fear is in control, so the public sell their stocks, which gives the markets momentum to the downside. Initially, these two emotions would appear to balance each other, however, fear is a much stronger emotion than greed, so the reaction to fear of loss is much greater than the reaction to greed. It is this reaction to fear that propels the markets downwards as people rush to sell their stake for fear of accumulating losses. Professional traders experience the same emotions (fear and greed), but they have learned to keep their emotions under control, so they do not react the same way. Professional traders will follow their trading system regardless of what emotions they are experiencing, (and believe me, they are experiencing the same emotions) and this allows them to consistently make a profit over time through market conditions that amateur traders lose money in. So now is not a time to panic, especially when you consider that before today 72% of companies reporting earnings actually beat estimates. My, we are a fickle bunch! In one of the most telegraphed Central Bank moves ever, the ECB out-stripped expectations and is looking to buy large sums of bonds on a monthly basis right through and towards the end of 2016. As I said in a private note to members yesterday, there are always risks involved in trading in front of large news events, but in system trading, if you were to run a back test, the system does not care about news, it just trades the price and the trend…I also mentioned that you have to be in it to win it…and we were. It was a fantastic day today, based on a calculated low risk/high reward basis we placed all our ducks in a row and we were able to take full advantage of the rally over the last few days. Now, just how long this rally will last is anyone’s guess, but once again the system was able to recognize another high probability bottom and swoop in. What is really important is that we don’t think in these situations, as Jesse is quoted as saying in the quote above, trading will always be an emotional battle, not an intelligent one. This is why it is so important to have a system and to more importantly follow that system to the letter. As human beings we can make mistakes, but they must be honest ones, when we make a decision based on emotions it seldom works out well. This is why Mr. Livermore said ‘you must know yourself’ to be a good trader. You must confront any propensity to stray from the rules and curtail them before it effects your account balance. U.S. stocks climbed on Thursday, extending gains into a fourth session, after the European Central Bank unfurled expanded stimulus and companies including Southwest Airlines posted upbeat quarterly earnings. ECB President Mario Draghi said the central bank would make monthly bond purchases of as much as $70 billion starting in March, and running through September of next year. Draghi’s announcement came after the ECB held benchmark rates unchanged at record lows. Thursday’s economic data had 307,000 Americans filing for jobless benefits last week, down 10,000 but more than the 300,000 forecast. After the boredom of being in cash for the vast majority of the 4% correction on the S&P 500 this year, I finally witnessed my first opportunity to go long yesterday. Upon the close today my entire portfolio is up a healthy few percent. The question is, is this the bottom of an extended move up or is history going to print a short term bounce and move prices lower. Trading is a probability game, and just like the house, you need to know your probabilities. I know from my indicators that it is highly likely that we will see a strong move higher soon. The spanner in the works is the actual announcement after the ECB meeting tomorrow. It is fairly well reported (leaked) that they will take steps to begin a European wide sovereign bond buying program to try and stimulate the Euro economy. Earlier there were reports of 500 Billion, now there is talk of 1.2-1.3 Trillion Euro’s. That is A LOT of money printing. And despite what the doomsayers will say, in the short term, money printing is fantastic for the stock markets of the world, I think the Fed in the US has proven that since 2009! U.S. stocks advanced on Wednesday, with Wall Street’s volatility unabated, as investors largely adopted the view that the European Central Bank would implement a large-scale bond-purchasing program. UnitedHealth Group rose after posting a better-than-expected fourth-quarter profit; International Business Machines fell after the Dow component offered a tepid outlook; Netflix gained after the supplier of streaming videos reported earnings that beat estimates. Multiple news outlets quoted sources in reporting the ECB’s executive board had proposed monthly bond purchases of roughly 50 billion euros in a quantitative easing program that would last at least a year. The CBOE Volatility Index, a measure of investor uncertainty, fell 4.7 percent to 18.95. Ahead of Wednesday’s open, stock futures maintained losses after data showing U.S. housing starts climbed more than expected in December in a hopeful sign for the sluggish housing-market recovery. Be Quick To Attack, But Be Quicker To Defend! Tony Robbins recently wrote an article to promote and outline his first book in 2 decades: “Money Master The Game”. Contained within the article was the little gem of wisdom above in the quotes. Somewhat modified from the Great Gretzky’s immortal line of going to were the puck will be. I have not yet read his book, but certainly plan to as he interviewed most of the billionaires on Wall Street to write it. The fact is, that in my experience both in testing and trading, it’s really important to anticipate before the majority of other people do. While protecting yourself, not only in terms of diversification as eluded to above, but also in the necessary action of taking small losses when you are wrong. My entire trading system can be described in this very sense. Buying shortly after heavy selling is counter-intuitive for most, in fact people say that trying to buy the bottom and sell the top is foolhardy. However, I say it is essential and should be the obsession of every trader that ever wishes to be among the elite. It will remain my obsession as long as I breath…I must anticipate AND be quick to defend. Isn’t that also the secret to the most successful sports teams whether it be football, soccer, basketball or hockey, be quick to attack, but be quicker to defend! The US market was closed due to Martin Luther King, Jr. Day. Will It Break The Neckline? The head and shoulders pattern is almost complete. The question remains, will it break the neckline? We have had quite the bout of selling since I posted the original picture, and a relief rally should come tomorrow, but it may be short-lived till we break below that lower neckline line. I am now waiting patiently in cash to harvest another bottom in the indexes. We are now in oversold territory, and that is always my favourite place to shop! However, I still I need it to stabilize tomorrow to confirm and overturn my downtrend indicator that has kept me out of trouble since the turn of the year. Only then will I be looking to re-invest. That the Swiss bank is merely defending its currency against a likely European Central Bank move that will see a massive bond-buying program likely to devalue the euro further. So the speculation is that the Swiss move was a signal that the ECB’s quantitative easing program would exceed market expectations. The ECB get together next week in a closely watched meeting that could have a significant bearing on market sentiment. One day all this cash floating around in the financial system will cause a crash, but I am going to cheer any moves towards easing as a crash is only another opportunity for me. 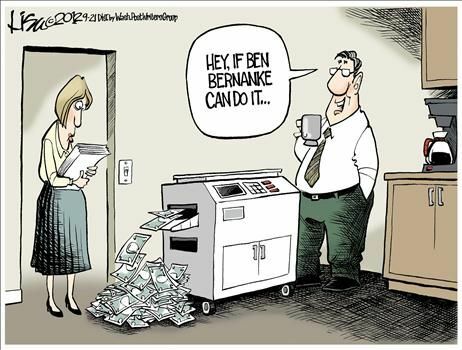 The fact is, market likes nothing better than money printing. As when it is printed, there is only one place to put it and that is in the markets themselves. We should see All-Time Highs by February I believe. U.S. stocks fell for a fifth day on Thursday, with the S&P 500 finishing below 2,000 for the first time in a month, as crude prices fell, large U.S. banks reporting disappointing results, and Switzerland’s central bank unexpectedly gave up its minimum exchange rate. Bank of America dropped after the bank reported a 14 percent fall in quarterly profit; Citigroup also declined as it posted a slim fourth-quarter profit. Target shares rose after the discount retailer should it would discontinue operations in Canada. A measure of manufacturing in the New York region climbed to 9.95, above estimates. Other reports had wholesale prices falling 0.3 percent in December, and a larger-than-expected number filing for jobless benefits last week, up by 19,000 to 316,000. Stock-index futures had fluctuated ahead of the open after the Swiss National Bank abandoned its three-year euro cap on the franc, with the move coming ahead of anticipated purchases of government bonds by the ECB. I like today’s quote. Sometimes the market really does feel like it’s personally punishing you. The fact is, it is not interested in you, it just ebbs and flows as it always has, and will continue to do after you and I are through with it. Good risk management and a proven strategy that wins more that it loses is the only thing between you and the success you seek. So in essence it’s not personal…it’s just math. Just as everything around us is math from the tiniest molecules to the rotation of the sun and beyond. All we get to control is how we act inside this math world. My system is not perfect, but I am less perfect, so having a mechanical (math) system is better than me indiscriminately making decisions on some chart pattern or previous observation that may not actually “statistically” be an edge of any sort! As I watch the market crash without me, I am not elated because I missed the carnage, I am acutely aware of what may lead to disaster if I let any success go to my head, You will never hear me brag of any wins (or in this case avoidance of potential losses), I must always remain humble towards the market, as although it’s not personal, it sure can feel that way sometimes, so treat the market with respect, do not be foolhardy just because it’s not actually personally out to get you. Instead, let it simply guide you via the only things that matter…price and the direction of the trend. U.S. stocks fell sharply on Wednesday, continuing losses into a fourth day, but came off session lows as crude reversed higher and after the release of the Federal Reserve’s Beige Book, which had central bankers expressing hopes for better U.S. growth. U.S. crude jumped 5.6 percent to settle above $48 a barrel. Perhaps a bottom is in place now? Already sharply lower, stock futures fell harder ahead of the opening bell after the Commerce Department reported retail sales slid the most in a year last month, down 0.9 percent. JPMorgan Chase dropped in early New York trading after reporting a decline in fourth-quarter profit; Wells Fargo also fell after the mortgage lender posted results in line with expectations. Now That’s What I Call A Volatile Market! I feel for anyone that bought into that fake rally today. Having watched the futures spike right before the open it was looking like a very positive day, but alas, that positivity did not last long. The range of the day in the S&P 500 alone was close to a 50 point swing between high and low. It is very rare to see such a huge move. My indicators are still saying it’s too dangerous to be in the market, so I am still patiently waiting in cash, and even though I expect to see a recovery of some sort tomorrow given that we have had 3 days of heavy selling, I will wait for less choppy waters before I expect to put capital to work. U.S. stocks fell on Tuesday, after a near 300-point rally on the Dow evaporated amid falling commodity prices and worries Germany would throw cold water on the European Central Bank taking additional steps to bolster the region’s economy. Reports from overseas that had Germany downplaying the notion of further quantitative easing by the ECB helped push the market lower, Art Hogan, chief market strategist at Wunderlich Securities, said. With the fourth-quarter earnings season started, investors are on the lookout for the the effect of crude’s decline on the S&P 500’s collective bottom line, with oil prices on Tuesday falling to near six-year lows as a major OPEC producer stuck to the cartel’s decision not to reduce output. Alcoa’s initial gains evaporated, with the aluminum producer turning lower after reporting better-than-expected results late Monday. Scaling back from a 282-point jump, the Dow Jones Industrial Average fell as much as 142 points, before ending at 17,613.68, off 27.16 points, or 0.2 percent. The S&P 500 shed 5.23 points, or 0.3 percent, to 2,023.03, with materials and energy hardest hit and utilities and telecommunications faring best among its 10 major sectors. The CBOE Volatility Index, a measure of investor uncertainty, rose 3.2 percent to 20.23. The Nasdaq declined 3.21 points, or 0.1 percent, to 4,661.50. Very choppy equity market. I am glad to be out in cash for a few days now as it tries to discover the new trend. The dip in oil again spooked the market. Just when the DAX in Germany was rallying 1.5%, the markets plummeted shortly after the open in the US on the back of a downgrade from Goldman Sachs regarding a major oil services company. This helped push down another extraordinary 5% drop in oil futures. Have you seen the gas prices lately? WOW! I honestly didn’t think I see gas under $1 a litre ever again! Passing a gas station last night said “0.84c”. So glad I replace 2 oil furnaces last year with “cheaper” geothermal…good grief…well at least it’s better for the environment! In the broad market, I suspect there will be a recovery tomorrow, but it may depend on earnings from the big banks and Retail sales for December that is out at 8:30am. Certainly JC Penny surprised to the upside in their sales last week, so perhaps there will be further cheer for the retail industry if their numbers were a taster for what is to come. Alcoa kicks off earnings season after the close today. U.S. stocks declined on Monday, extending a two-week slide, as worries about the falling price of oil took hold before the start of quarterly earnings. Oilfield-services provider Schlumberger declined after Goldman Sachs Group downgraded its shares to neutral from buy, while also cutting its outlook for benchmark oil prices. Exxon Mobil and Chevron led blue-chip declines, which had a 56-point gain quickly evaporating and the Dow Jones Industrial Average falling as much as 157 points and lately off 114.06 points, or 0.7 percent, at 17,623.31. The S&P 500 shed 18.78 points, or 0.9 percent, to 2,026.03, with energy leading declines and telecommunications the sole sector in the green among its 10 major industry groups. The Nasdaq declined 46.24 points, or 1 percent, to 4,657.78. On the New York Mercantile Exchange, crude futures for February delivery below $46 a barrel for the first time since April 2009, ending down 4.7 percent, at $46.09 a barrel; gold futures rose to $1,232.80 an ounce. After the close, Alcoa reports fourth-quarter results, marking the unofficial start to the earnings season. The aluminum producer gained after Nomura Holdings advised purchasing its shares. JPMorgan Chase, Wells Fargo and Citigroup are among the major banks scheduled to report earnings later in the week. Yet another incredible “V” bottom in the market, shown above in the S&P 500 Chart. But after such a retracement, can we really expect it to go straight back up to all-time highs? I personally don’t think so, my view has changed since the 100 point drop in the S&P over the last week or so. I think now we will see a lower high put in coinciding with further selling. Just about the only chart pattern I ever pay attention to is the “head and shoulders pattern”. It is a pattern that many market participants recognise and act upon, ultimately driving it to become a reality on a chart. The market surprised everyone and went straight back to new highs in December after a sizable retracement, but can it do it again? In the illustration above I am showing the more likely scenario. In my opinion a lower high and therefore a “right shoulder” seems likely. So while I am disappointed that I did not catch the low here after missing most of the downside, I am somewhat suspicious of this latest spike higher over the last two trading days. So let us see how this pans out. Should we be breaking out to new highs I will be looking to get back in again. But for now, I will remain patient and wait for my time to strike. U.S. stocks surged for a second day on Thursday, with benchmarks turning higher for the year, as oil steadied and on thinking the Federal Reserve and the European Central Bank would buttress the global economy. Data Thursday had jobless claims dropping by 4,000 to 294,000 last week, with the better-than-expected number coming a day before the payrolls report for December. Comments late Wednesday by Fed Bank of Chicago President Charles Evans helped Wall Street’s bullish slant, with Evans saying he did not believe the central bank should be in a rush to hike interest rates. In a letter to European lawmakers, ECB President Mario Draghi said the ECB would reassess its monetary-policy stance early this year, and that ECB moves could include sovereign bond purchases, Bloomberg reported on Thursday. The S&P 500 is without doubt the main benchmark against which stock market investors measure themselves. The age old question being: Did I beat the market? The market being represented by the S&P 500, which is 500 companies closely correlated together to show their collective movements on a minute by minute, day by day basis. What most people don’t realise is inflation is not the main driver to appreciation of the Indexes. One of the main reasons the “benchmark” keeps rising over the long term is due to the indexes choosing who can stay in their little club. The S&P 500, as well as all other indexes, are run by actual companies with shareholders. And those shareholders want a bang for their buck. They want to see that index rising. How do they achieve this? Simple…turnover. Out with the old and in with the new. Names are added and deleted regularly. 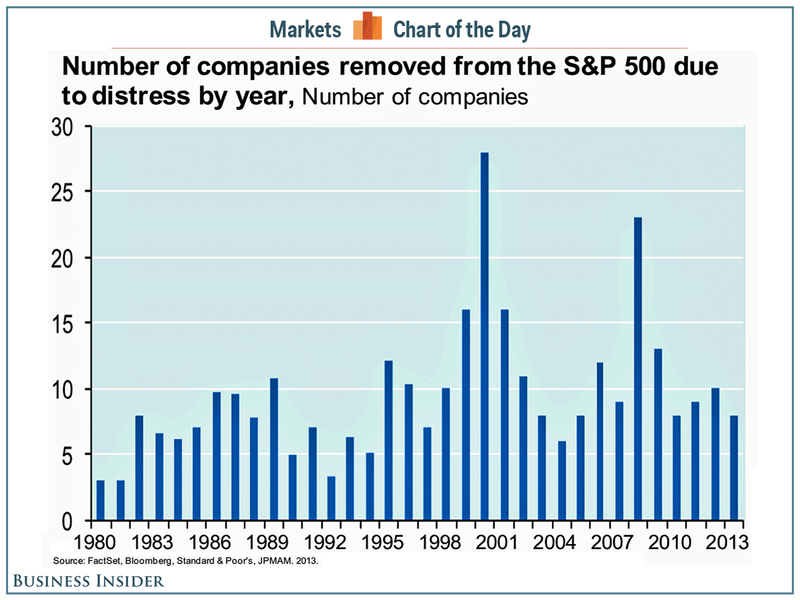 In fact, did you know that since 1980, over 320 companies were deleted from the S&P 500 for business distress reasons, which implies a lot of turnover. This is not including the mergers and acquisitions that have happened over those same decades. So for those that like to think they are investing in a slow and sleepy index, not so much the S&P 500 is a mover and a shaker when it comes to including the best of the best. U.S. stocks jumped on Wednesday, with the S&P 500 rebounding from a five-session dive, as U.S. crude stopped a four-day skid, concerns eased about a Greek exit from the European Union and investors offered a favorable reaction to minutes from the Federal Reserve. The key drivers to equity gains appear to be a stabilization of energy, easing concern about a Greek exit and a positive tone to the Fed minutes. Benchmark indexes retained gains of roughly 1 percent after the Fed release, with the December gathering of the Federal Open Market Committee indicating inflation would not have to climb from current levels for the central bank to begin raising interest rates. Also helping bolster market sentiments, Germany left open the door to discussing options with Greece’s next government on its debt, easing worries about a Greek departure from the euro zone. Private employers added 241,000 jobs to their payrolls in December, surpassing projections of a 226,000 gain, according to the ADP National Employment report. The figures come two days before the U.S. Labor Department’s nonfarm payrolls report, with economists surveyed by Reuters looking for employment growth of 240,000 last month and a jobless rate of 5.7 percent. European stocks climbed and the euro dropped as the risk of deflation furthered the argument for monetary support.